Azerbaijani people are celebrating festive Novruz Holiday -- the symbol of winter's end and the advent of spring, an affirmation of life in harmony with nature, indication of equality and fraternity and renewal of nature. After the restoration of independence, Azerbaijanis began to celebrate Novruz more solemnity. In addition to attaching nationwide importance to Novruz, Heydar Aliyev always stood by his people over the holidays, congratulated and called on them to live in unity and accord. This most cherished holiday of the Azerbaijani people has an ancient history. It is often linked to Zoroastrianism, the oldest of the monotheist religions. Scientific researches relate the Novruz Holiday to the period of prophet Zardush, which dates back 3,500 to 5,000 years. Azerbaijan is a country of oil, gas and mud volcanoes. Spontaneous fires on the Absheron Peninsula have attracted fire-worshippers who revere these places as holy. This laid the foundation of the Novruz customs and traditions related to fire. In the ancient times Novruz in Azerbaijan was celebrated for seven days. The number seven is still reflected in the tradition of having seven different dishes on the holiday table. Another theory suggests that Novruz dates back to ancient Mesopotamia. This holiday was celebrated in the ancient Babylon in Nisan (March, April) and the celebrations lasted 12 days, with each having their ceremonies and performances. Houses and yards are cleaned, trees are pruned and fields cleared on Novruz eve. 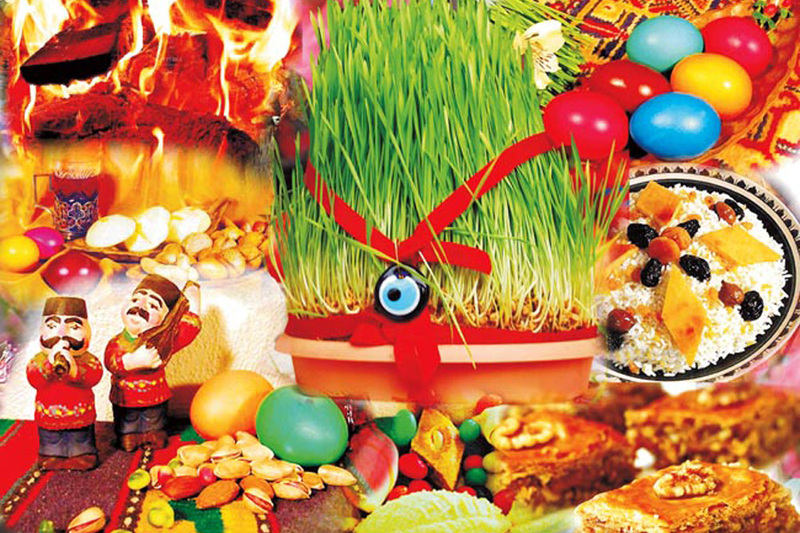 Celebrations of Novruz begin a month before the actual holiday date. Novruz is related to four elements of nature -- water, fire, earth and wind. A legend goes that God created man from earth and water, gave him warmth and ordered the wind to wake him up. Novruz Tuesdays are considered sacred. The four Tuesdays are named after these elements and called Su Chershenbesi (Water Tuesday), Odlu Chershenbe (Fire Tuesday), Hava Chershenbesi (Wind Tuesday) and Ilakhir Chershenbe or Torpaq Chershenbesi (Earth or Last Tuesday). According to the folk belief, water purifies and stirs; fire, soil and wind awaken the nature, the trees begin to blossom. All these symbolize the coming of spring. Novruz is associated with many traditions. On Ilakhir Chershenbe everybody should jump over bonfires seven times saying "My yellowness is for you, your redness - for me", which means "take away my diseases and give me your strength". The fire should not be put out with water as it is better to let it burn out. On Ilakhir Chershenbe or in the Novruz evening, one can make a wish and go to the neighbor's doors at sunset. This tradition is called "gapipusdu". In front of each door, one drops a key onto the ground and overhears. The first two overheard words will indicate whether or not the wish will come true. Novruz is a favorite holiday because every year traditional sweets of the national cuisine such as pakhlava, shakarbura, shorgogal and badambura are cooked and served at the festive table. Also "govurgha" (toasted wheat) is mixed with nuts (mainly walnuts, hazelnuts, almonds and chestnuts) and placed on the table along with the sweets. The decoration of the festive table is khoncha, a big tray with "samani" -- freshly sprouted wheat and a symbol of hope for an abundant harvest in the coming year. The tray is placed in the center with candles and dyed eggs by the number of family members around it. The candles are lit and must not be blown out ahead of time. The table should be set with seven dishes. Sour or bitter food is not included on the khoncha. Pilaf (rice) is one of the main dishes for the Novruz dinner. One of the interesting traditions of Novruz is "papagatdi": children knock at the neighbors' doors and leave their caps, hats or a little basket waiting for candies, pastry and nuts. Young men place handkerchiefs under the doors of their beloved ones. If the man's feeling is reciprocal, the girl should put sweets into the handkerchief. Novruz in Azerbaijan is associated with the beautiful green color and is symbolized by the growing of "samani". It is traditional to plant a tree on Novruz. One of the golden rules of Novruz is that people should not curse, lie, swear or gossip -- they should not do any bad things. It is a rule that people who have quarreled with one another should renew the relationship and forgive one another. Everyone should celebrate Novruz at their own home with family members. An ancient Novruz tradition is to burn "uzerlik" (rue), which provides protection from the evil eye and negative energy. According to the folk tradition, at the moment the new day of the New Year arrives, you should go out of the house into the yard or stand at an open window and make a wish. Musical gatherings take place at Novruz: folk singers sing songs, public games such as the comic Kos-Kosa show are held, tightrope walkers demonstrate their skills, the wrestlers test their strength and shows are staged on public squares. During Novruz people give each other a holiday portion called "Novruz payi". Holiday cakes, samani and candles are put on a tray and given to the neighbors and friends. Acording to the belief, the tray should not be returned empty or the house will no longer be prosperous. Benevolence and charity for those in need are also a Novruz tradition. The number of weddings increases during Novruz. According to an ancient belief, a family started during Novruz will be happy. Babies born during the holiday are named in honor of the holiday: boys are given the name Novruz while girls are called Bahar, which means spring. The largest samani in Azerbaijan are grown on top of the ancient Maiden Tower in Baku. A local beauty, Bahar khanim or Miss Spring, chosen by the people, lights the torch on top of the tower and welcomes Novruz. The Novruz holiday was included into the Representative List of the Intangible Cultural Heritage of Humanity by UNESCO in 2009 thanks to the efforts of the President of the Heydar Aliyev Foundation, UNESCO and ISESCO goodwill ambassador, First Lady Mehriban Aliyeva.